The Ten Minutes Until Clean Philosophy has to start with a clean room (in this case, it going to be the downstairs of the house which in my home includes the kitchen, dining room, living room, and a powder room). So, if I start with a clean downstairs, my goal is to keep it neat enough that it can go completely back to the original state of clean within ten minutes time. This means that when I am in the living room working on school with little and middle people, and my big kids are doing school in the kitchen or dining room, I need to be keeping an eye on my little people and making sure that they are not pulling out more than can be properly put away in ten minutes. This philosophy works really well in our home for a few different reasons. 1. It’s easier to keep a house clean than it is to clean a dirty house. It’s a universally accepted truth that it is much easier to maintain a clean house than to clean a dirty house. A clean house makes you want to keep it clean. Making sure that the house only get ten minutes down the road to chaos helps to keep the momentum going. 2. It allows us to live, play, and work with freedom and tidiness. I don’t like being the mom who is always fussing and clucking at the children to “clean that up, that’s not where that goes, only one book out at a time, etc.” I’d much rather let the children play and live and enjoy the space. Putting a toy away as soon as you are done with it gives you a definite advantage, but the lines get blurred when there are multiple children in a room. If Johnny is playing with the train, and Timmy is waiting for his turn, it’s going to start a fight of epic proportions if Johnny does what Mother has been nagging him to do since he was a year old, and put the train away as soon as he’s done with it. If you add in another child or two, who is also playing with a different toy…can you see how policing and enforcing the “one toy out at a time” rule becomes logistically taxing? 3. It keeps the children involved in the process. The children know and understand that when Mom gives the call “Okay kids! Time to clean up!” that it will take us all less than ten minutes to get it done. They know this because that call goes out multiple times a day. The children know that if every person doesn’t pull his own weight, it takes longer for everyone. They also know that if Mom sees a child standing around trying to look busy, but not actually doing any work, they will be assigned an extra job. If this is an idea that you would like to implement in your own home, then you will need to experiment a little. Your ten-minute mess will look much different from my ten-minute mess, depending on the amount of helpers that you have, along with how well they are trained in what you want them to do. If you are starting from scratch, meaning that your children are not already helping you keep the house tidy, then you will have a much smaller margin of mess until your children get up to speed. Step one: always be to start with a clean’ish house. 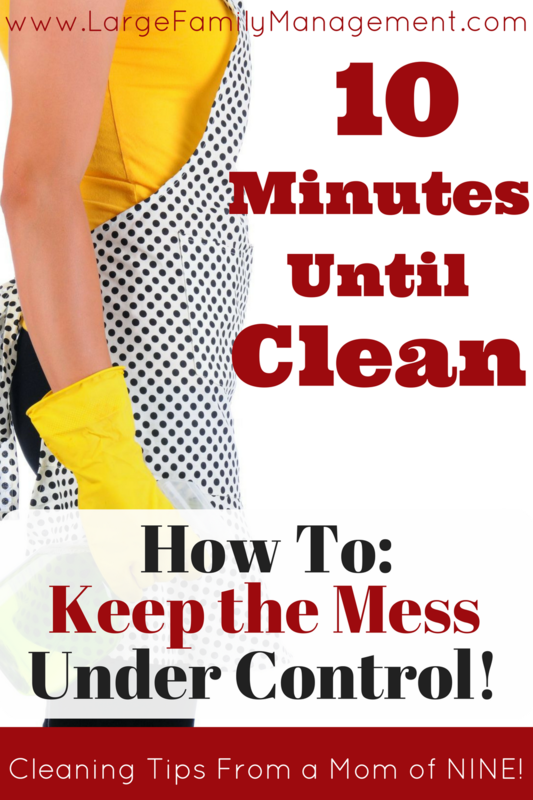 Step two: find out how much mess your family can get cleaned up in 10 minutes. Do this by timing yourselves. One afternoon, when the house needs to be pulled together, start by assigning each of your children a specific task. Instruct the child to come back to you for an inspection once her job is complete. So, give each child specific instructions on what you want them to do, set the timer and go. Whenever a child is done, and his work has been inspected, assign another specific job with an inspection at the end. You must inspect every.single.job. Don’t be nit-picky, but insist that it is done properly. (this is the number one way to avoid the martyr-syndrome “I’m the only one around here who knows how to do anything.” Make sure to keep a pleasant attitude with a smile on your face. The best way to keep this time from being something that your children dread each day is to maintain a good attitude yourself. Channel Snow White and the forest creatures cleaning up the Seven Dwarves’ nasty cottage. Put on some music and red lipstick, whatever you need to do, but keep it pleasant. Step three: Once the house is back into reasonable shape (you are not aiming for perfection here, you are aiming for reasonably clean and organized), it’s time to stop your timer and assess. How close did you come to ten minutes? Were you way over, or way under? If it took you twenty minutes instead of ten, then you know that you allowed the house to go too far, so next time you will need to start your 10-minute tidy up sooner. If it only took the family five minutes to get everything ship-shape, then you know that you can allow a bit more mess before cleaning next time. Also, take into account that your children will get faster and more efficient. They will be able to accomplish way more in ten minutes after practicing this routine for two weeks then they could today. So you will need to adjust when that happens. If you think that you are going to be able to clean your house the one time, and then totally maintain it, and never have a slip-up, well, you may be right. But if you are, you are a much better housekeeper than me! I let the house get beyond Ten Minutes Until Clean at least once a week. And I always kick myself when I do. Because in order to get it back, I have to work for it! After you’ve been doing Ten Minutes Until Clean for long enough, it doesn’t feel like work, it’s just a habit and part of the day. But once you go over that ten minutes into, God forbid, twenty or even thirty minutes (eek! ), it definitely feels like work. Need help staying on top of the chores? Download my FREE cheat sheet! The best thing that you can do is reign it in. Get it under control before your mess gets worse. Turn on some music, assign everyone a task, get it knocked out, and then celebrate when you are done! Whatever you do, do it with a good attitude. Your children will pick up on any sarcasm or exasperation on your part. Is it better to have a messy house with a sweet, happy mama, or a perfectly clean house with a crazy OCD mama? Messes happen occasionally (at least weekly for me) and they just need to be dealt with in the same manner as any other less than ideal situation. It’s always easier to maintain a clean home than to start from scratch. 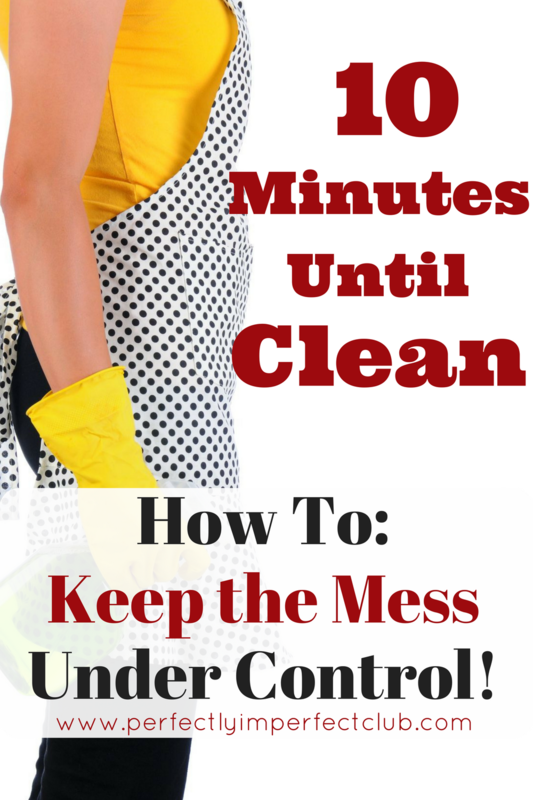 So figure out what your family can clean up in ten minutes, and go from there! Ashley – I am loving your site! I just found it via Mom Delights. I am a mom of 9, too, and our house needs a bit of a reset. I have signed up for the 30-day challenge and I was also hoping to use some of your freebies, but I don’t actually see the links. (For example, there is no actual link on this post or the one with the Tidy Tasks). Is that my computer doing something funny or is there something off on your end? This concept sounds incredible. But my kids are 7, 5, 3, & 1. Either I can tidy or I can try to force my kids to tidy. Either way it seems like I just end up frustrated and angry. Can this actually work with Kids this age? My big ones have already realized that making it a race or speed game is too much work.